Honeycutt-Nuccitelli Climate Bet Progress Report…So Far New Decade Is Cooler Than The Last…Ready To Concede? Browse: Home / 2013 / June / 08 / Honeycutt-Nuccitelli Climate Bet Progress Report…So Far New Decade Is Cooler Than The Last…Ready To Concede? To mark the start of the new decade, NoTricksZone and its readers made a climate bet (see right side bar) against two warmists from Skeptical Science: Rob Honeycutt and Dana Nuccitelli (and others). Also see update-5. The warmists are pledging more than $14,000.00! Rob overall has been a good sport and is a pleasure to deal with. Dana, on the other hand, has been, shall we say, a bit abrasive. 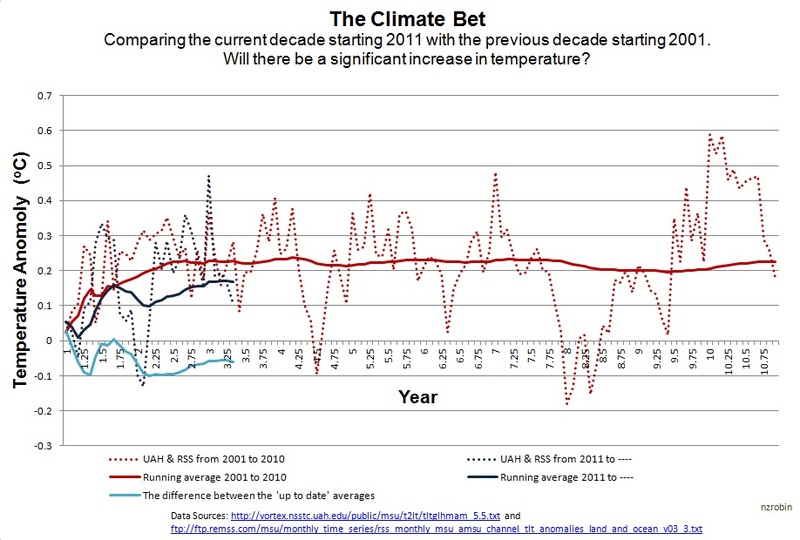 The bet is on whether or not the current 2011-2020 decade would be warmer or cooler than the previous 2001-2010 decade. NTZ and its readers say it will be cooler or the same. Messieurs Honeycutt and Nuccitelli say it’s going to get warmer for sure. After all, man is spewing more CO2 into the atmosphere than ever. The money won will be donated to a charity for children in need. Almost two and half years have now passed and I think it’s a good time to see how the bet is coming along. Thanks to Robin Pittwood and his Kiwi Thinker blog, we now have preliminary results for the first 2 years and 5 months. Clearly in the chart above we see that the current decade is running a bit cooler than the last one. In fact, temperatures haven’t warmed in 15 years. Of course it’s still early and nobody really knows what tricks Mother Nature could play. But Rob and Dana really should be scratching their heads, though. Okay, the bet was made before they found out that oceans eat up warming. Indeed it is warming, they insist, but the cooling is just covering it up! You just wait…the warming will be back, they keep saying. And when it comes back, it’ll be for real. Besides, cooling is caused by warming anyway. Right? Problem is, nobody knows when the warming will be back. Even the Prince of Global Warming Darkness himself, Hans-Joachim Schellnhuber of the Palace of Doom and Gloom in Potsdam recently said the warming may be delayed even another decade. Doesn’t look good, Rob and Dana. Like I wrote, it’s remotely possible that it will warm a bit this decade, and maybe Rob and Dana could even eke out a victory. But will a few hundredths or even a tenth of a degree be enough? 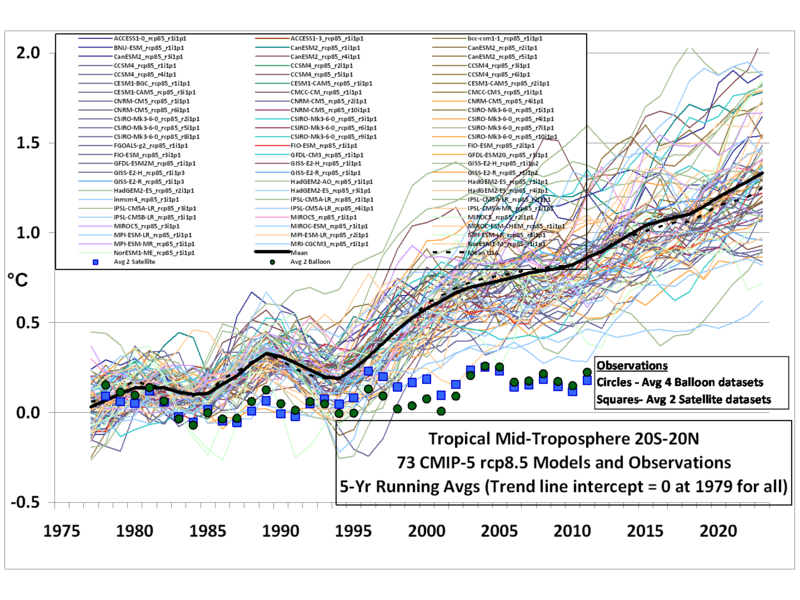 Not really because of the model projections are rising much faster and the divergence between observed temperature and model projections will be more glaring than ever. Even if the two do pull off an upset, it’ll be a hollow victory. They’ll still have lost the science argument, which is all about sensitivity. By the end of the decade, it could be that we will not have seen any significant warming in over 22 years. To be on the safe side, I’ve asked Robin Pittwood to disclose his calculations and the data he used to produce his non-hockey stick chart. ROTFL! Thanks, I completely forgot about Phil Jones’ outrageous behaviour – on which our German media never ever commented! On the risk of repeating gossip, I have read somewhere that Rob H. said that 2013 would be for him a decisive year. Is that true? If so, Pierre, you may expect around Christmas time our lost son coming home. BTW, I really liked Rob and Dana here as a comic couple. If they are married, so to say, they may both return to NTZ. I booted Nucci out because he kept citing “Cooked” papers as real science and for his general über-sophomoric behavior. I don’t think you ever included my name in your list of cool side bettors? I am on the cool side – put me down for $100. Please add me to your list, and please make sure that you use my current email address from this message. Thanks! Sorry about the clerical error. Your name is not on the “update5” list. You’ll find the reader comments to be very interesting if you click on the update-5 link at the start of this post. In fact there are many very nice reader comments left by Dana and Rob in all the updates. See “Climate Bet” Category in the right side bar. One prediction most likely to come true, is that when it comes time to pay out, they will be missing. What was the currency used called again? I think it was the USD, right? It will be very cheap in the end. Could I ask you to provide an updated list of bets, please? The last list did not include many of the later bets placed, particular those placed after you extended the deadline to October 1. Sorry, I will add your name and pledge to the list. My clerical error. Looks like a safe bet to me. The PDO has gone negative, the AMO will soon go negative, the current half-height solar high will decline to a severe solar low in 2020 when sunsopts are expected to be absent. The effect of the previous solar high is buffered by about ten years and the support for temperatures that that gives will have gone well before 2020. Volcanic activity is increasing and any decent eruption will drop temperatures for some 3 years, Hekla looks good for a decent sized blast before 2020, maybe any day. Clearly mother nature is on the side of children in need. I wrote Rob to consider the possibility of a volcano, but he said even with a volcano CO2 would carry the day. Your cooling bet will win easily. I believe that by 2017 there will be no doubt as to which way the climate is heading. I also made a forecast after a warmist prodded me that the Arctic sea ice extent will stop around 6 mil sq km. That may be a bit high of an estimate, but I was somewhat aggravated. WUWT was asking the readership to bet on the Sept average extent and I choose 5.3 to 5.4 mil sq km. That is only4 months away to see whose guess is correct. Pierre, one decent-sized El Nino is going to drag the curve way up, just like happened in 1998. Before that even the tropospheric temperature data from Messrs. Spencer and Christy was flat. After that, even they were stuck with an increasing trend. So I think the bet is going to go to the warmists. And also, one decent-sized El Nino is going to show how climate warms — as a step function. Not something that the models capture because they don’t do air-sea interactions well yet, something the modelers frequently note. Good luck with the bet. You’re going to lose. I just checked the chart on Roy Spencer’s site. I don’t see an increasing trend from 1998 until today. The departure from average (vertical scale) in 1998 was about +0.65 and the latest number shown is +.07. Just saying . . .
Like I said, squeaking out a victory is nowhere enough to win the debate. It gets down to CO2 sensitivity. Why should one El Nino affect a 1o year average to such an extent? Judging by the red curve, once we were 3 years into the bet, the level of 2001-2010 deviated only very slightly and ended up in much the same position. By contrast, after 3 years the black 2011-2020 curve is already 0.05 degrees below the red curve. It has considerable ground to make up particularly when you consider these are smoothed values. None of the forecasts I have seen predict sudden warming over the next 5 years, so we may find that the black curve has got even more ground to make up in 5 years time. But it is to your credit if you still feel confident. I know the trend of historical temperature figures have been adjusted in the past – though this is less easy to justify with satellite figures I fear. If you contact the organisers of the bet, they may still be willing to accept your placing a bet on the warm side, even at this late stage. Don’t bet the house on it, though. That pretty much rules out a switch from gasoline to electric vehicles, because that would increase electricity consumtion.